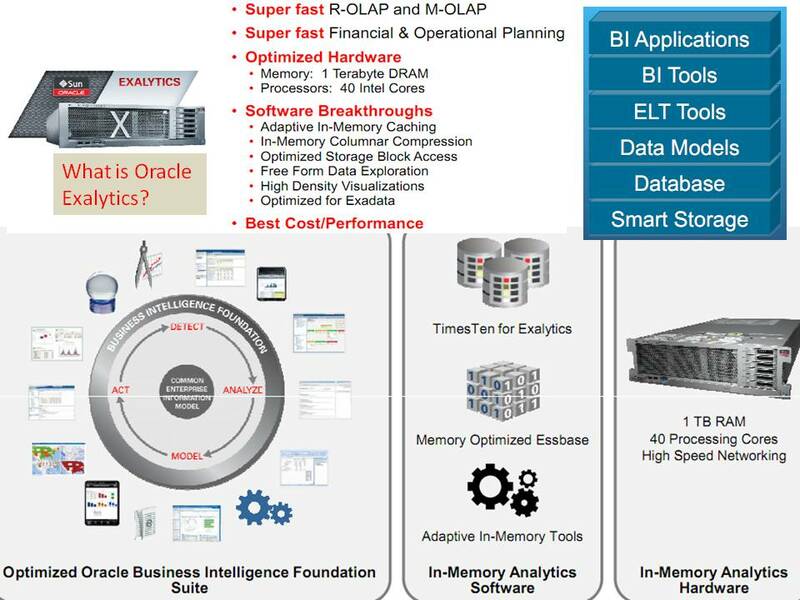 Following the success of its Exadata (database as a service) and Exalogic (middleware-as-a-service) engineered systems, Oracle unveiled Exalytics Business Intelligence at Oracle OpenWorld 2011. The goal of these appliances (engineered systems) is to help IT groups further shrink data center costs, increase system utilization and enable better application integration. All goals that CIOs everywhere continue to struggle with. CIOs now face an interesting decision matrix: Exalytics/Logic/Data systems versus traditional build from components versus hosted. With ExaSystems, Oracle has a tremendous market advantage. Oracle owns most of the software that enterprises need today. Via acquisitions, Oracle owns the whole stack! Web tier, Middleware, Database software, Database tier, Storage tier. With Sun Microsystems it’s ideally positioned to maximize the platform capabilities. It’s easy for Oracle make its own software play nice on the Exalytics, Exalogic and Exadata platforms. Oracle’s appliance approach is a simple one. Oracle configures, builds, tests, deploys, and maintains its database appliance as a unit. The objective is to provide a solution – “It just works,” but enterprises will have to pay premium prices. While Exadata and Exalogic were introduced to enhance database and application processing, Exalytics would be used in business intelligence to handle and analyze big data data. These Big Data appliances which combine both hardware and software, aim to simplify the IT infrastructure, reduce costs and improve productivity/speed. So what’s the big deal? Oracle is a serious player now in the Big Data Analytics business. Most large IT shops want to buy fully packaged systems rather than muck around with various components. Our discussions with clients indicate that Oracle is getting tremendous penetration with these products. Oracle has already sold 1000+ units of Exadata. Larry Ellison, with typical hyperbole during the unveiling of Exalytics at the Open World 2011, announced that this new engineered system “would deliver data analysis at the speed of thought.” Just like its sister products, Exalytics would feature parallel hardware and software architecture and dense data compression. “With memory of 1 TB, the average response time improvement over existing business intelligence is about 18 times,” he added. 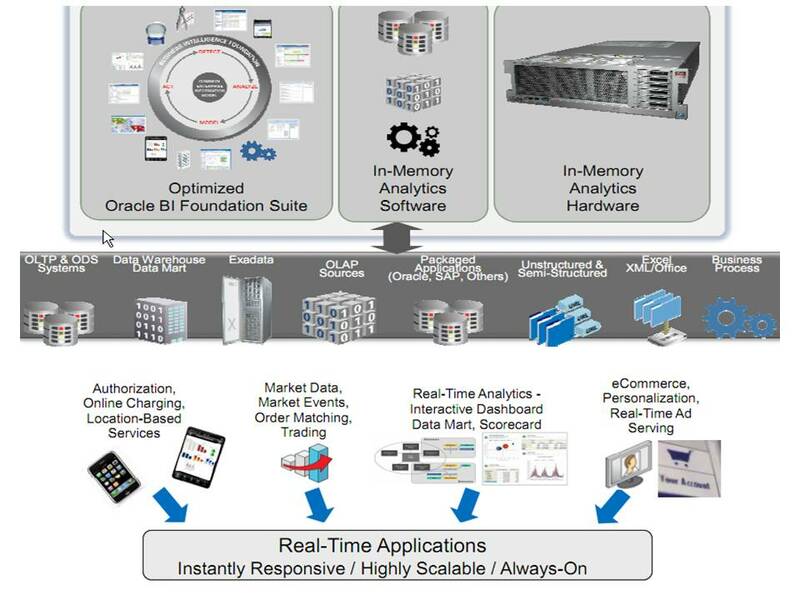 The keys to interactive speed-of-thought analytics are (1) TimesTen In-Memory Database + Adaptive In-memory Cache; (2) BI Foundation Suite. Adaptive In-Memory Cache decides what gets stored in-memory; adapts to change in analytic workload; optimizes performance for best responsiveness. In-Memory Database efficiently manages in-memory data. 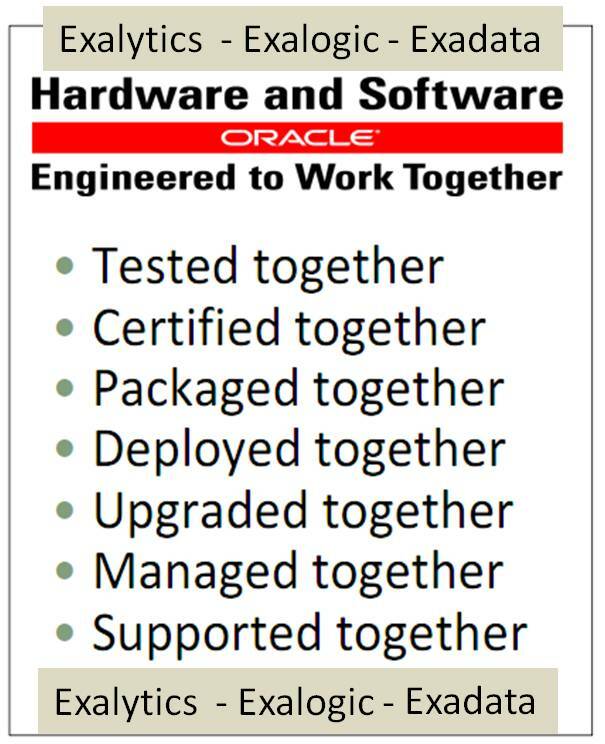 Exalogic Elastic Cloud is an engineered hardware and software system tested and tuned by Oracle to run Java and non-Java applications with extreme performance. It’s built on a foundation of Oracle Weblogic Server and other Java-based milldeware products. Exalogic is aimed at addressing the enterprise need to consolidate data centers. Exalogic Elastic Cloud can support thousands of Java and non-Java applications with differing security, reliability and performance requirements — making it an ideal platform for enterprise-wide data center consolidation. The virtualization is enabled by Solaris Containers which combined with enterprise-class multi-tenancy and ability to meet the most demanding service-level requirements make it an interesting foundation for private cloud computing. With engineered systems, Oracle is betting that most firms want to avoid the pain: Wouldn’t it be nice to skip the 6-12 months of building and testing the whole platform and have installed in days? Throw in the risk of projects failing and the choice becomes more obvious. Exadata is a database machine that provides extreme performance for both data warehousing and online transaction processing (OLTP) applications, aimed at making it the ideal platform for consolidating legacy apps. The bottleneck on many (most) large datawarehouses (15-25 TB) is between the disk and the db server(s)! So how to speed it up? Make the pipe bigger/faster or reduce traffic on the pipe. Exadata does both by offloading (doing more in the storage layer than the database layer) and Smartscan (query optimizations covered by “cell smart table/index scan” wait event). Exadata hides much of the administrative overhead in terms of performance tuning. For example, the Exadata machine has three replicas of persistent data in flash SSD for redundancy and also caches the most accessed elements in physical memory. If the data needs to be repartitioned because access patterns change, the Oracle appliance will move the data around without taking the database offline. Reads of dirty cache entries may slow down during the process, but the system itself stays running. Since the appliance is basically an Oracle Real Application Cluster with part of a query engine embedded in each storage controller in order to minimize I/O, the system stretches what a vanilla Oracle Real Application Clusters (RAC) system could do. What is the business value? The true goal is to enable database-as-a-service. Customers can further reduce IT costs through database consolidation, manage more data on multiple compression tiers, improve performance of all applications, and make faster decisions in real time. Exadata has evolved considerably. Oracle introduced the first Exadata database appliance in 2008. The first version consisted of its database software and an HP x86 server aimed avoiding the hardware bottlenecks that slowed down computers processing information in its database software. The new version is Exadata X2-8. 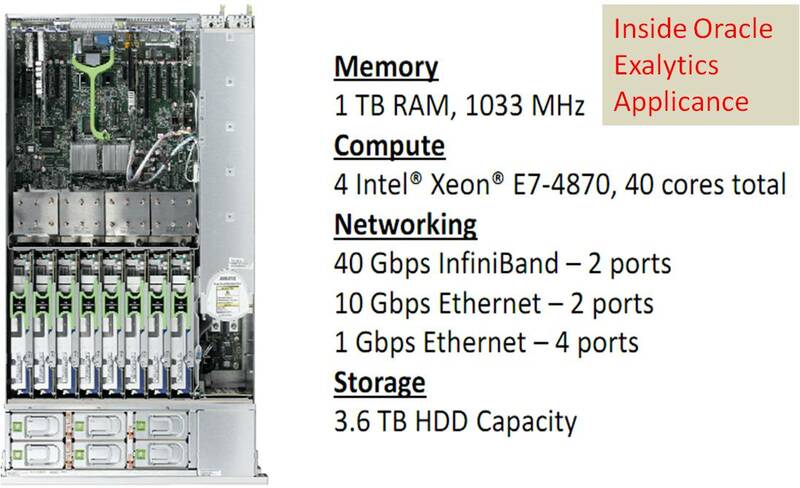 All in, a full rack X2-8 is likely to cost about $3.9M, including first year maintenance. Subsequent years of maintenance will be around $700k annually. That puts us at around $6.6M across 5 years on a TCO basis. Keep in mind that software maintenance lives forever and accounts for two-thirds of the annual fee. In comparison, industry analysts suggest Netezza customers pay $20,000 per terabyte. So if you have a petabyte of data, you can do the math. Oracle is making a strong move in 2011 to cement its market leadership and demonstrate continued product innovation like Exadata appliance. Oracle’s BI growth is being driven by a shift from planning to operational “every day” analytics. As a result, Oracle chose to deeply integrate the separate product lines after the Hyperion acquisition. 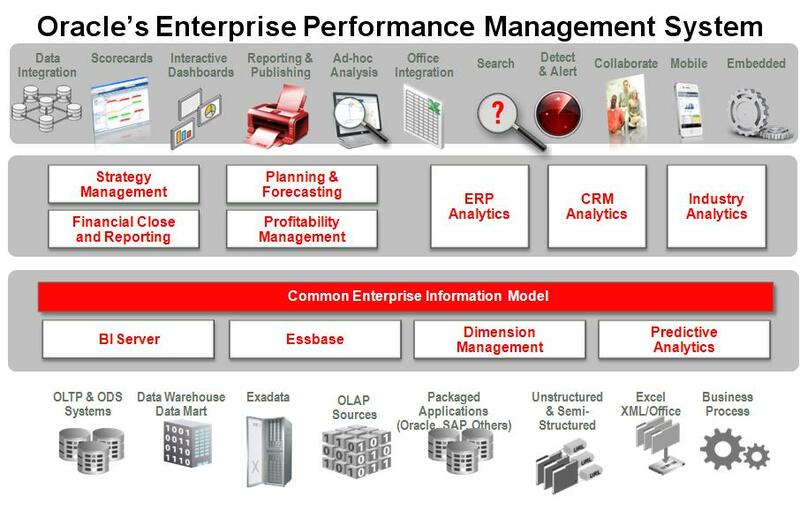 Oracle like other vendors is bringing BI and EPM — combines financial performance management with operational analytics. Their BI framework is shown below. Southwestern Energy had an e-business upgrade problem. 16 EBS instances, 7 OBIEE instances, 12 Hyperion instances and 2 Standby instances. All running on over 40+ servers. After detailed analysis they chose to move to Exadata. With its Exalytics engineered systems, Oracle is now a formidable player in the analytics and big data space. They are really on the right path now. They are attacking the gnarly IT problems of continued cost takeout, consolidation and system utilization. They have also figured out how to leverage the Sun Microsystems acquisition. The early adopters of Exalytics, Exalogic and Exadata include the telecom industry, banks, airlines, Government and data service providers. Exalytics would be an open solution for use in heterogeneous IT environments. 2) When Exadata Is NOT Justifiable? (1) Size & performance requirements too low i.e. not cost-efficient (consider Oracle DB Appliance); (2) Hosting non-Oracle databases, e.g, Migrate! ; (3) Pre-11gR2 database versions, e.g., Upgrade! ; (4) Application design prevents massive scalability e.g., Serialization points, single threaded processes.